On Wednesday morning, the snow began to fall and didn't stop until almost 10 inches blanketed the ground. Now I know that may seem like a small amount to some of you. But, to those of us in the Southern United States, that amount of snow is a game changer. Life, as we know it, comes to a complete halt until the snow melts and the roads begin to clear. Don't get me wrong. I love the snow. I love looking at the snow...for all of one day. After that, I'm ready for it to clear out and for life to get back to normal. Because, here in the South...We...Don't...Do...Snow! But, if we're forced to DO SNOW, we do it well. So, would you like to know what I've been doing during my "snow confinement"? 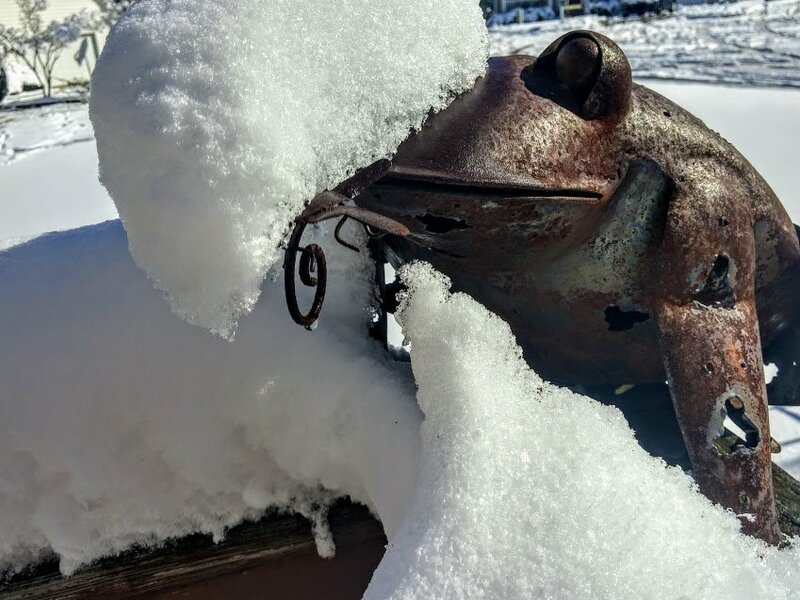 While Mr. Frog kept watch over the snowfall from his perch on the patio, I sat with my cup of tea and contemplated the fate of the beautiful golden pineapple sitting on the counter in my kitchen. 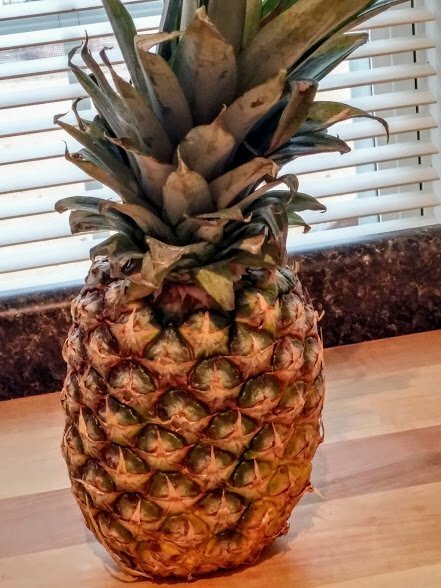 I was determined to do justice to this delicious smelling pineapple. 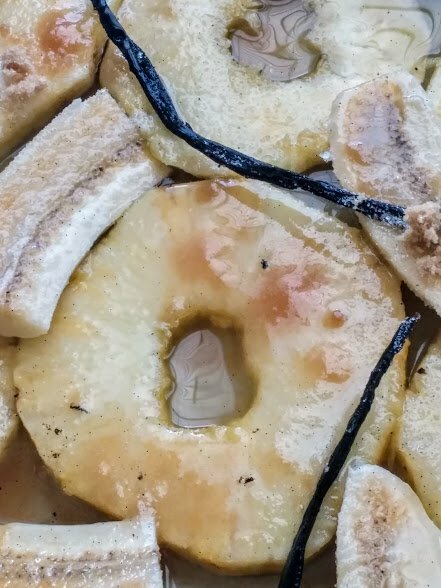 So, while Mr. Frog was frollicking in the snow, I got busy with some Vegan mojo for this fragrant and perfectly ripe pineapple. Soon, this golden beauty (along with it's tropical friend..the banana) would be slow-roasted in a rum sauce. 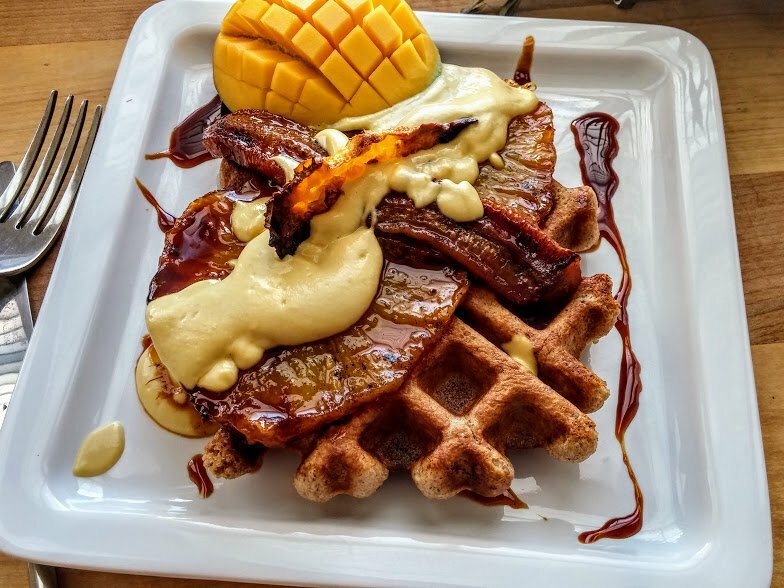 Then, befitting it's new station, it will be served atop a homemade yeast waffle and drizzled with a mango cashew cream and a rummy coconut cream! 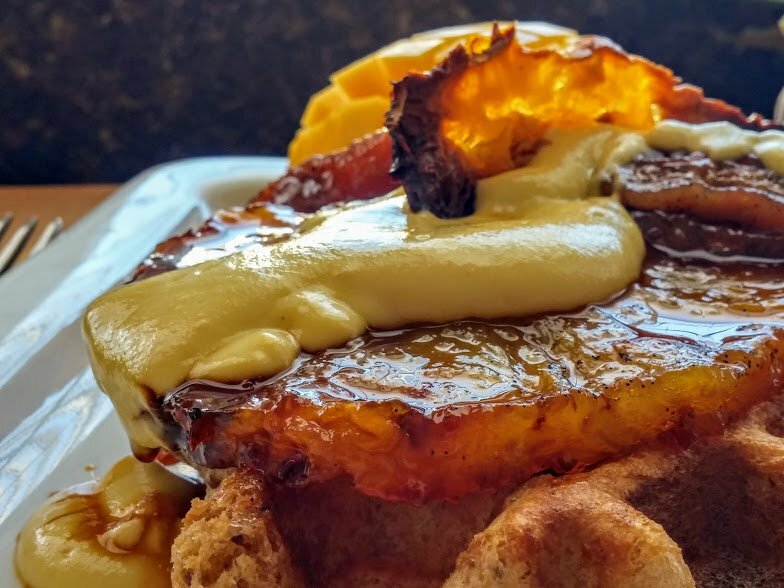 The first step to creating this amazing meal is to gather the ingredients and make pineapple chips to garnish the Rum-Roasted Pineapple and Bananas. 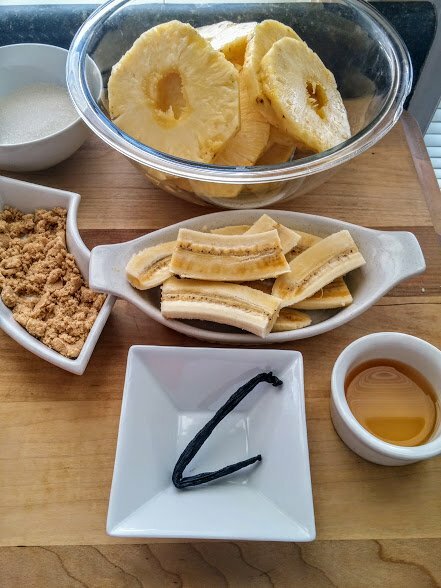 Then, gather the ingredients for the star of the show....the Rum-Roasted Pineapple. Again, simple ingredients. Fresh pineapple, sugar, brown sugar, rum, pineapple juice and vanilla bean. Isn't it amazing how such super simple ingredients can come together to make something so divine? Look at all of that goodness, just hanging out and ready to be slow-roasted in a 400 degree F. oven. 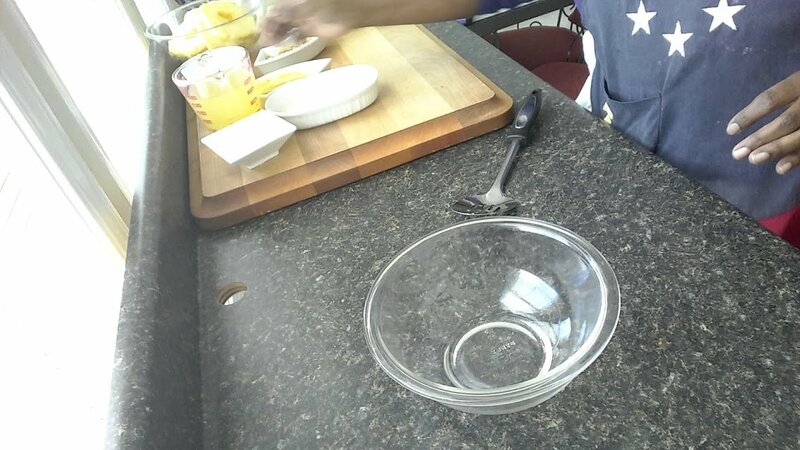 Just in case you're unsure about how to scrape out a vanilla bean, check out the cool "how to" video below. 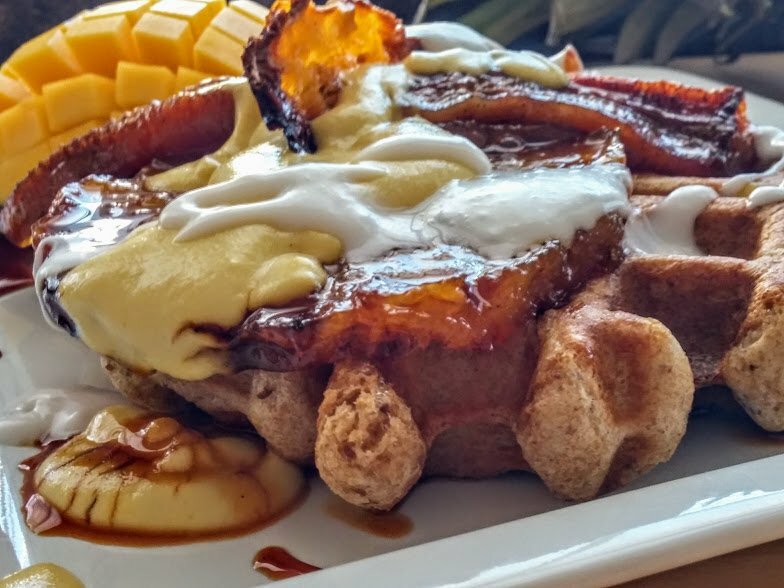 While those pineapple are roasting, whip up a batch of Yeasted Waffles. And, some creamy Coconut Mango Cream and Cashew Cream to top it all off!! 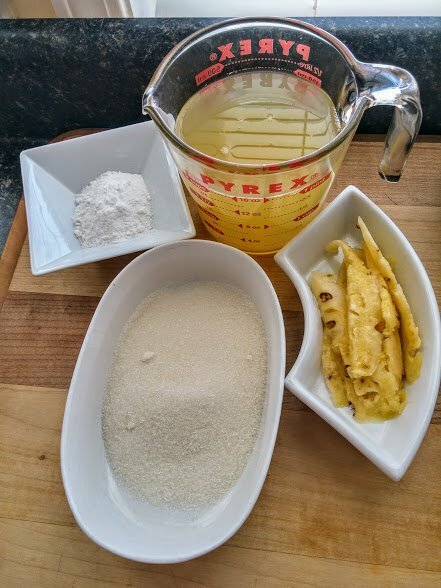 Recipe available upon request to the first Steemian friend who says today's words : "Pretty Pineapple"
Until tomorrow, all the best my fellow Steemians! Hi, I'm Benita G. You may also know me as, or call me, @AtMemesTable. Hope you loved this post. Now, make me a happy girl and upvote my post and follow me. I would love to have the opportunity to talk to you and to get to know you and you me. Check me out later! 'Cause you'd best believe that I'm going to be checking you out! Find me @AtMemesTable.